In previous articles such as stop blaming others and take control over your life and stop complaining and be thankful for the things you have I talked about victimhood and how to regain control over your life. As being a victim is only one piece of the puzzle, I will use this article to discuss the drama triangle and how to step out of it. When you’re a victim life is difficult and not treating you fair. Once you experience something good, you can bet on it that something will happen that puts an end to your, temporary, well-being. Life is mean and a struggle for the victim. Victims seem to attract bad luck, but maybe one day, when they used up all of their bad luck, fortune will come their way. There’s always something happening to the victim and they make sure everyone knows about how pitiful they are. Victims can be found anywhere: at work, among our friends, in our family, or maybe even closer: our spouse. We all know someone who is playing the victim. It is quite easy to identify and blame a victim. They are easy to spot and, let’s be honest, they are doing it all to themselves. If they want to play the victim role, well let them be, they deserve it. It’s no wonder they won’t make it to the top. Victimhood is a way of life. These are pretty harsh words, which I usually don’t write down like this. You may have reacted a little angry as there may be a victim inside you as well. Or you totally agree with me: finally someone who speaks the truth! Or maybe you feel sorry for the victim as they don’t deserve to be treated like this. These poor victims; all they need is some extra attention and you’re the one that is providing it to them. This may come as a shock but a victim is never alone. You could be part of the drama keeping victimhood alive. You may even play a bigger part in this drama than you realize. Welcome to the drama triangle between the persecutor, the helper and the victim. The drama triangle is a model of dysfunctional social interaction created by psychotherapist Stephen Karpman. Let’s have a closer look. As mentioned above, the victim is on the defensive side of life, always trying to survive. Things are always happening to the victim as they feel helpless in a world that is threatening them. Victims get their needs met when they get enough attention. Victimhood can have a huge impact on our well-being and some victims identify so much with their role that they even develop physical illnesses to get, and keep, the attention they need. Every victim needs a rescuer. Rescuers love to help, even when they are not asked to do so; helping others is what makes them happy. When there’s no victim around, the rescuer will not rest before he can found one to take care of. It will not come as a surprise that the victim will welcome the rescuer with open arms: finally someone to take care of him. Rescuers and victims reinforce each other’s behavior. Persecutors blame and criticize victims and rescuers without providing real solutions. They feel superior and with their behavior they are in fact affirming the roles of the victim and the rescuer. With their blaming towards the victim, the victim will feel smaller than he already his, reinforcing the feeling that he is going to get hit and desperately needs some help as he is not up to the responsibility. The persecutor feels also superior to the rescuer as he cannot understand that the rescuer is stupid enough to help a victim. The most likely response from the rescuer is that he will increase his helping efforts even further now he knows the persecutor is not going to help as he only blaming the victim. After all, someone needs to take care of that poor little victim. Now you know the players in our drama, you should have seen how they each re-enforce and need each. It is not uncommon that players in the drama switch roles. A rescuer, after years of helping without getting the recognition he needs, may become a persecutor blaming others, especially victims. Or a victim, thinking he stepped out of that role, is now giving meaning to his new mission in life: helping others. 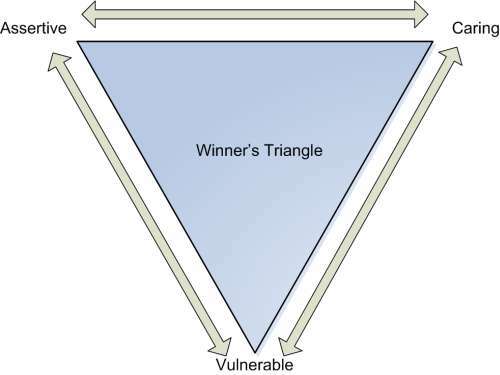 There’s a way out of the drama triangle and it’s called the winner’s triangle. First you need to be aware and recognize which role(s) you play in life. Be conscious what your behavior is towards others and how you can assist them in becoming more independent, instead of making them dependent on you. Instead of being the persecutor you can become more assertive. Transform victimhood into vulnerability and take responsibility for your own life. And once you stop being the rescuer you can become caring towards others, helping other only when they ask for it, making sure they can stand on their own two feet knowing everyone is responsible for their own happiness. Sometimes the best help you can offer is to do nothing. Thank you Patrick for your insights. Have you heard of David Emerald’s Empowerment Dynamic? In his book, The Power of TED* (*The Empowerment Dynamic) he talks about another escape from the drama triangle through the antidote roles of creator, challenger and coach. Thanks for informing me about TED. Looks very promising. If you would like I can do a review of the book on my site. Let me know what you think. That would be great! I can have a copy sent to you if you do not have one. Just let me know with an email. Next: What is a life coach?